If you're interested in learning Spanish in Latin America, Guatemala is an excellent choice. The Spanish teachers at our school are fully qualified university graduates, lessons are offered on a one-to-one basis, meaning those who learn Spanish in Antigua receive a highly personal service, and because the cost of living is low in Guatemala, the Spanish courses are really good value for money. So, come to Antigua, Guatemala and learn Spanish with us! 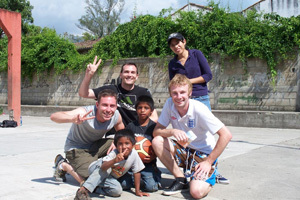 We also arrange Volunteer Work for students who are interested in this, as well as a wide range of visits, activities and excursions, some of which are included in the cost of the Spanish course, or at very little extra cost. Guatemala was home to the ancient Mayan civilization and still has a large indigenous population today. This is a beautiful and hospitable country and Antigua, surrounded by mountains and volcanoes, is one of the most enchanting colonial cities in Latin America. People here are friendly and the cost of living is low, making Antigua an ideal location in which to learn Spanish. Our school is located in the historic heart of Antigua. All classrooms are arranged around a spacious garden. Accommodation is arranged with carefully selected host families, who usually live within easy walking distance of the school. The friendly staff at our school organise a full cultural programme: Salsa/Merengue lessons, guided tours of Antigua, ecological tours, film evenings, horseback excursions, plantation visits, mountain bike tour, picnics and parties, as well as a wide range of Volunteer Work. The host families are especially welcoming and provide a great insight into Latin American culture. The accommodation provided is basic but comfortable and offered on a full board (3 meals per day) basis. Students booking our 'Host Family Plus' accommodation will also have access to a private bathroom. Fly to Guatemala city. Transfers from La Aurora Airport are available. Approximate journey time is 1 hour.